For many of us, change is a consistent part of our work lives, whether taking on a new job, learning a new system, or re-tooling how we do things. Sometime change is easy, and other times it is difficult and does not seem to take hold. 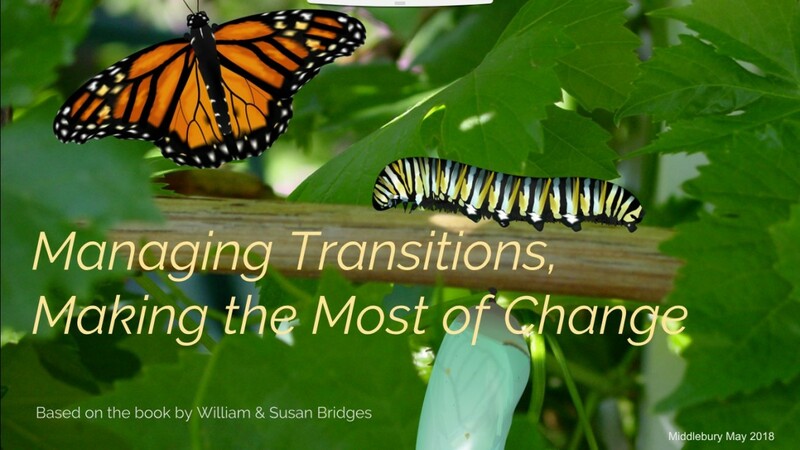 In their book, “Managing Transitions: Making the Most of Change”, William and Susan Bridges provide a helpful model that addresses change and transition, along with proven strategies that can help us manage the process successfully. This entry was posted in Midd Blogosphere and tagged Midd News & Events, Midd Points on July 12, 2018 by Sheila Cameron. This entry was posted in Midd Blogosphere and tagged For Faculty, For Staff, Midd News & Events, Midd Points on May 9, 2018 by Sheila Cameron. The hours in a day are finite yet the demands on your time seem limitless. How can you effectively get your work done when you’re pulled in so many different directions? This workshop will put you back in charge of your day so you can get organized, be effective, and focus on what’s important. You’ll learn time management tricks, strategies to stay on top of email, and ways to communicate your tasks and priorities to others. Join us for this lively and interactive program. You’ll leave with tools you can put in place immediately to get more done with less stress. *To join the webinar, you will need a computer with the Zoom software downloaded and an internet connection. You can create a Zoom account for yourself at any time by visiting go/zoom, clicking sign-in, and logging in with your Middlebury credentials. Monterey users will need to use their full @middlebury.edu address. More details on how to join the webinar will be sent before the session. This entry was posted in Midd Blogosphere and tagged Midd Points, Midd/MIIS Collaboration on November 13, 2017 by Sheila Cameron. Click here to register by Thursday, April 6th – Spaces are limited! The hours in a day are finite, yet the demands on your time seem limitless. How can you effectively get your work done when you are pulled in so many different directions? This workshop will put you back in charge of your day so you can get organized, be effective, and focus on what’s important. You will leave with tools you can put in place immediately to get more done with less stress. All participants receive bound note-taking guides to use as a lasting resource. Colleagues on our MIIS campus – Porter Knight is a Vermont-based consultant. If this topic is of interest to you, please contact Melissa Sorenson and we will explore possibilities. This entry was posted in Midd Blogosphere and tagged Midd Points on March 28, 2017 by Sheila Cameron. *This Dale Carnegie course is accredited and offers 2.8 CEU’s (Continuing Education Units) and is supported by the Continuing Education Fund Benefit. Participants are required to participate in at least 7 out of the 8 classes to receive CEU credits. If you miss classes, make up classes for all sessions are available in the Dale Carnegie Essex, VT location. This entry was posted in Midd Blogosphere and tagged Benefits, For Faculty, For Staff on February 15, 2016 by Sheila Cameron. You are invited to this 90 minute workshop to explore the mystery that is work/life balance. Leave with a simple tool to create balance in your life, and all attendees will be entered to win a Waterfalls Day Spa gift card at the event! This entry was posted in Midd Blogosphere and tagged For Faculty, For Staff, Wellness on May 18, 2015 by Sheila Cameron. Join us for this lively and interactive program. We’ll include time for discussion so that you can plan how best to apply these ideas. You’ll leave with tools you can put in place immediately for a more effective and peaceful work day. *Though there is some new material, this workshop includes most of the core components that Porter Knight has presented in past years and in other formats, including: GEARS of Organizing, RRRIPP through paper, RRRIDD yourself of email, TrueTime Planning. *What’s in this session that is also in the Stress, Neuroscience & Productivity session: small reference to brain function, point of the decision, balanced scheduling, and dealing with conflict. This entry was posted in Midd Blogosphere and tagged For Faculty, For Staff, MiddPoints, professional development on April 21, 2015 by Sheila Cameron.